A hairdresser from a rural part of China has built an airplane capable of flying at a height of 3500 meters. The plane’s designer, Wang Qiang, is from a rural part of China’s Sichuan province. He just studied one year of physics in middle school, and worked as a hairdresser. Wang started designing airplanes in 2005 after being inspired by an article that he read in a magazine. He produced his first working plane within three months, using scrap metal and homemade tools. The Chinese media has described Wang as a “Farmer” suggesting that he does not have the urban-residence permit given to China’s legal city-dwellers. 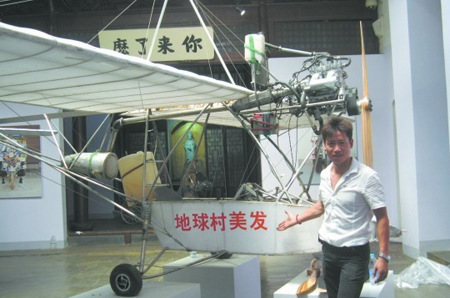 Wang Qiang and his first home-made plane. A nearby flying school offered Wang the use of one of its runways so he could continue his research into flight, which has cost him over 100,000 RMB. Wang took up casual work in the coastal city of Ningbo to fund his experiments. Wang finished work on his second plane last winter. The plane, named “Wang Qiang Number 2,” can reach heights of 3500m, and speeds of over 90 kilometers an hour. Here’s a video of Wang’s second plane in flight. The plane is currently on display in Shanghai’s Hong Miao gallery, as part of an exhibition titled “Transport – Homemade Vehicles from around the World.” The exhibition includes a robotic rickshaw built by a farmer from near Beijing, as well as a home-made submarine. Wang’s test-flights have not been without incident. His plane has caught fire in mid-air several times. Last spring, Wang crashed his plane into a river, eventually managing to crawl out and swim to safety. Wang now hopes to obtain a pilot’s license, and design a two-seater aircraft so his girlfriend can join him for future flights.